Shaved Zucchini Asparagus Salad with Lemon Vinaigrette is a light & healthy summer salad. Made with fresh ingredients & loaded with flavor! Shave both the asparagus and zucchini using a vegetable peeler. 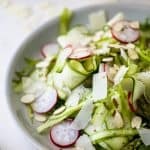 To a large bowl add shaved asparagus, zucchini ribbons, arugula, shaved parmesan, radishes and raw almonds. Set aside. Drizzle the dressing over the salad and lightly toss.